It's only September but a residential street in Ohio, United States, is already decked out in Christmas decor. Neighbours have come together to bring some festive cheer to Brody Allen, a two-year-old boy who is gravely ill with a rare form of brain cancer. "He woke up one day and the Christmas tree was out. He doesn't know it isn't really Christmas. He is just enjoying it," Brody's 21-year-old sister McKenzie told The New York Times. Outside of their home, Brody sits in a little red wagon that his siblings pull around to help him take in the sights of a snowman, Santa Claus, Christmas tree in their neighbour Barbara Elliott's yard. Ms Elliot said it broke her heart when she learnt of Brody's condition, so she told her husband "We got stuff, let's decorate!" Another neighbour followed suit and put up snowflakes, poinsettias, and garlands on her fence and lights. Brody first complained of dizziness in May which was initially thought to be a symptom of an inner ear infection. However, further tests at Cincinnati Children's Hospital revealed that the boy had tumours in his brain and around his spinal cord. They found four embryonal tumours with multilayered rosettes - an aggressive brain cancer that often starts in the cerebrum which controls thinking and voluntary movement. According to Mayo Clinic, such tumours may cause headaches, nausea, vomiting, lethargy, dizziness, double vision, unsteady walk and seizures among others. The hospital gave Brody the most aggressive chemotherapy it could, but the cancer "didn't respond to treatment very well," McKenzie said. One of the tumours grew in size while a fifth tumour emerged. Radiation therapy was out of the question because of Brody's small size. After a four-month stay in the hospital, the boy's family took him home and strove to keep him happy. With time running out for the toddler, they're celebrating Christmas in September, and set up a Facebook page in June to request for Christmas decor donations. The family received much more than festive decor from their neighbours. Besides sending the Allens Christmas cards, gifts, and snacks, the community is now planning a Christmas parade for Brody on Sept 23. "We just wanted to do something to make this really special for them, because they are going through a hard time," neighbour Amanda Beckman said. The illness has taken its toll on the boy, sapping his energy and making him unable to move his left arm and leg. But the Christmas decorations seem to be lifting the ailing tot's spirits. "The first night we put out lights, we rolled him out in his little wagon and he just let out the biggest 'wow!'" said McKenzie. 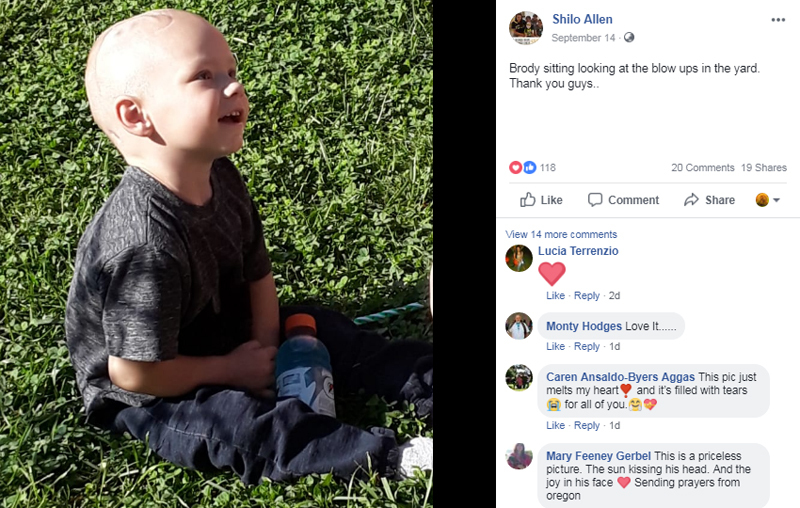 "It is really hard, but I love seeing the joy in his eyes," said their mother Shilo.